Brie: What was your first impression of the XCHC? Preston: Inclusivity, that was my first impression of the XCHC. After living in Christchurch for a few months I’d seen mostly the construction, that first impression on the surface that most people get. I got online to find community projects, not expecting to be a part of any of it, just to see what else was going on. The first chef’s table was March 2016, it was an invitation for anyone to come have a meal with strangers and artists and meet new people, and that kind of genuine connection was exactly what I was looking for. B: When you started, your job description didn’t really exist. How would you describe your role here? P: The job includes everything from changing loo paper to being the person that supports an artist through their creative process from start to finish. Everything from making sure the holes in the wall got filled and painted after an exhibition, to sending the money to artists after their work has been purchased; some for the first time. After that first chef’s table I started volunteering for events, the basics like helping people set up the room, showing them where the light switches are, how to start the projector. It wasn’t just running events or taking care of the facilities, it was everything together. Events and how to book them, host them, and follow up for feedback. Next was residents - how to bring them on board, support them, publicise what they’re working on. Then the cafe, and after that the administrative work. At the end of my first month, we changed the phone number on the website to my phone number. B: And life has never been the same. B: How has it changed since the beginning? P: I think we’ve cleaned up processes to make it easier on ourselves and the people that come in. 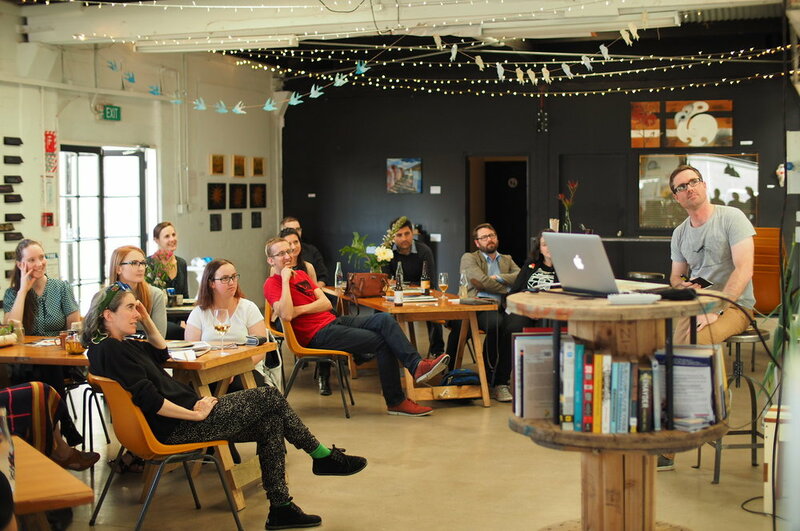 In the beginning, XCHC organised its own events to fill the space and bring people in, but now the wider community are seeing themselves in the space and are hosting events regularly, which has allowed the Exchange team to step back. The purpose hasn’t changed, neither has our relationship with the residents or the public, but we’ve added to what we do. We’ve gone from an empty building with ripped out floors, to a space that serves the community. B: Why do people come to XCHC? P: I don’t know if you’ve seen the newspapers, but we’ve got the best toasties in Chch. [laughs] They could come for any reason but they'll leave with more than they expected. I came for lunch, and next thing I knew I was hosting events. This place grows on you, some residents might come because they want to have a place to paint from but then eventually decide to have an exhibition. B: Their relationship with Exchange grows and changes as they keep coming back. P: Yeah, the first person to exhibit this year ended up donating work that now hangs in the accommodation. I remember telling her about how the room would be named after her, which was not part of the original plan. We never know what might happen when we initially invite people in. It doesn’t matter if you identify as a creative person, you can still be a part of the creative community. B: Everyone has creative potential, creativity is really just self-expression. P: Yeah. And the creative practitioners benefit as much from feedback through public exchange as they do from support within their own networks. B: No one owns the XCHC. We get asked that all the time, so I’d just like to clear that up. Can you talk about how this space is governed and where profits go? P: It started as a trust, and now the business under that trust you could say is owned by the purpose - cultivating a creative ecology. Everything falls back to our values and assessing how we’re actually doing with connecting people and supporting them to grow and work on their creative selves. The culture of the space is made up of the people that take part, so we’re looking at how that might be worked into our structure in the future. We are not dependent on grant funding like many community spaces. 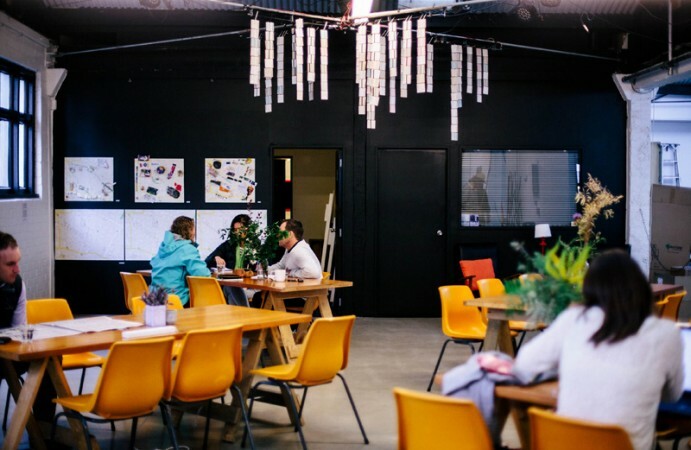 Our current operations are funded by the communities who support the cafe & bar, rent the venue for events or exhibitions, hire workspace, or stay in our accommodation upstairs. As a social enterprise, our business model has to work with the impact that we strive for. We make financial decisions that support our purpose, rather than profit shareholders. It is challenging to have substantial overhead costs in rent, power, and staff wages, while at the same time a desire to make our services and facilities affordable to those who use the space. With this in mind, we’ve had to adapt by extending our hours and space, like turning what was once an underused boardroom into a loft apartment for visiting travellers and creatives within our networks. B: How do you make decisions about where profits go, when they’re not going to shareholders? P: It’s easy when profits are small because we can look at what the physical space needs to better support the people inside. Right now we’re looking at using platforms like co-budget so that all of the residents have a say and a vote in what they need the most. Some profits are going into the Emerging Artists Fund, because we don’t want to only support established artists or the people that are already here, but we want this to be an entry point for new people who don’t yet know what opportunities are here for them. That fund is to subsidise the cost so that people who want to step into the XCHC aren't stopped because of their financial situation. B: With ownership comes responsibility, do you see the opportunity for a space like this to be collectively owned so that the governing responsibilities, the risks, and the successes can be shared? What does that look like? P: I don’t know what that looks like, but it’s true that if people want to have this vibrant supportive atmosphere then they need to take part in creating it themselves rather than rely on one person to do it. I think that people want that ownership, they don’t just want it to be done for them. Maybe a model where the residents and the artists that create that inclusive and exciting atmosphere by working there, are rewarded for it because it draws in the crowd. People’s ideas and creativity inevitably ebbs and flows, so how do we work together on keeping it up, or raising it when it's low. How is that responsibility shared. B: Can you talk about what came out of the Ākina Elevate program? What do you want people to understand about running a social enterprise? P: Knowing that the Ākina team is available is such a relief. And they’ve connected us with so many other people and organisations. It was great to separate the focus of Elevate on four modules (purpose, customers, money, and operations) because it can all blend together in the day to day. We learned how to use tools that world leading organisations use, and realised that they can be applied to social enterprise in a really practical way. Creating customer personas, mapping out their journey and figuring out where they need your support. For us, its about how to attract an artist when they’re working from their garage and ready for that next stage of their creative work. I think that what a lot of small businesses have done, and what we did, is just spread the word as wide as possible and hope that it lands on the right person at the right time, and that is exhausting. Elevate helped us to be more intentional with our actions instead of just constantly trying ideas and hoping something comes back. It helped us question when things weren’t working, and learn how to measure our impact. The time that I’m spending now is a lot more valuable. B: Can you explain the relationship between serving community groups, small business, and corporates? P: It’s about finding a balance, asking what each group is contributing to the whole, and how XCHC can support them. Artists create the sort of atmosphere that attracts the public to visit, and businesses to work in the space. The corporate world is starting to recognise the need to promote their social and environmental impact, make their operations more transparent and be more involved with community organisations. XCHC gives corporates an opportunity to use space for their own needs while contributing to our purpose supporting creative development. Whether it’s a coffee a week or a big event, every dollar spent at XCHC is an investment in the creative community. B: A colleague in social enterprise was talking about entitlement - both from community sector that expects services and space to be free, and from corporate sector that expects a more polished operation and higher level of service than many social enterprises can provide. Do you have any comments about how to educate people about that middle ground? P: Making money is not our core purpose, but we also need money so that we’re not dependent on funding. That’s a new conversation to most of the world, we’re still exploring what that looks like. We have to be transparent and manage expectations so that when people come to the XCHC they know exactly what we are and what we’re not. It piques people’s curiosity - what do you mean you don’t have an owner, what do you mean you put money back into the community, how do you survive, how do you pay your bills? That opens up dialogue, and that’s the beauty of bringing in different groups and having these conversations. Everyone has questions around how this is working and we definitely don’t have it completely figured out yet, but we’ve learned a lot about what that balance looks like. B: Is the balance around helping community groups recognise the value and cost of what they are asking of us, and helping corporates with the mind shift about how they can start participating instead of being a passive consumer? P: Yeah, definitely. It also encourages people to collaborate. It’s good to encourage people to think of the value of their time and their work. We charge a lower rate for community groups using the event space than corporates, but by charging them, it gets the community groups thinking about what they’re asking of us. It might make them think, how do we get other people to value what we’re doing. It makes sustainability part of the general conversation when it wouldn’t normally be. B: What worries you about the future of Exchange? P: I worry about the people in the space rather than the space itself. Individually, did they have a good experience, did they learn something, what sort of feedback did they leave us and how can we process it in a healthy way. I want people to use negative feedback to help them grow instead of feeling like they’re not worthy of whatever it is that they’re working on. I do fear that all of the future of the space will come onto me. I can see this goal of having a building where all these things are happening, and it would be great to let someone who is more of a designer of shared spaces step into that role. I wonder how we can open source it so that communities can take initiative while still being sustainable and serving the purpose instead of just having their own agendas. Personal agendas, even my own, could crush the potential. B: What excites you about the future of Exchange? 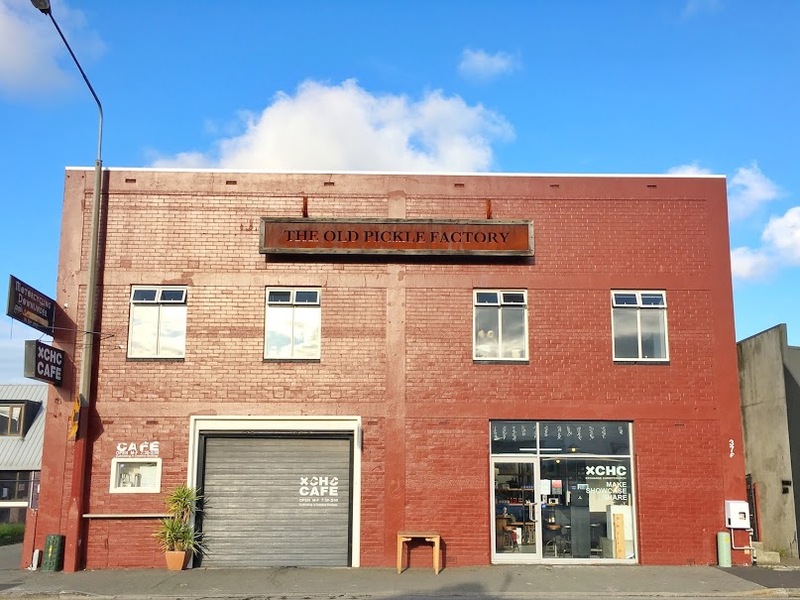 P: Reflecting on the amount of things that have come out of a 500 sqft building in an industrial area of Christchurch and knowing that we could have these results anywhere. Exchange is a physical space, rather than an online space, to find connections. It’s a space where everyone belongs. I think that’s important when we’re trying to create a more connected society, and it’s exciting to be a small piece of that. B: Yeah, the building itself is just a shell, and it changes every day depending on who is bringing their energy in. It’s a space where people can come in and be themselves, and it is a true reflection of what is going on in the local creative community. P: Yeah, there’s definitely nothing hidden, it’s all there in the open. It can be scary because we really allow everyone who is in the space to create it. And it will be interesting to see what that looks like in other places or in other buildings. P: We’ve seen the value of XCHC in Christchurch, and we’ve seen how it could offer the same value in other cities. The operations has become a smaller percentage of what I do, with more time being spent on that bigger vision. As a traveler I want to go other places and experience the cultures and communities there, but it’s hard to find those spaces. As Exchange grows, I’d like to see an invitation to work and participate in these places of culture, community and creativity. Maybe the chef at Exchange San Francisco can switch roles with the chef at Exchange Paris, and they can take their learnings, local culture, and energy with them and share that with a new community. That freedom to move about, while knowing that you have a home base and more opportunities than you went in with… that’s a part of our future work culture, and I’m excited to see where that might grow as well.